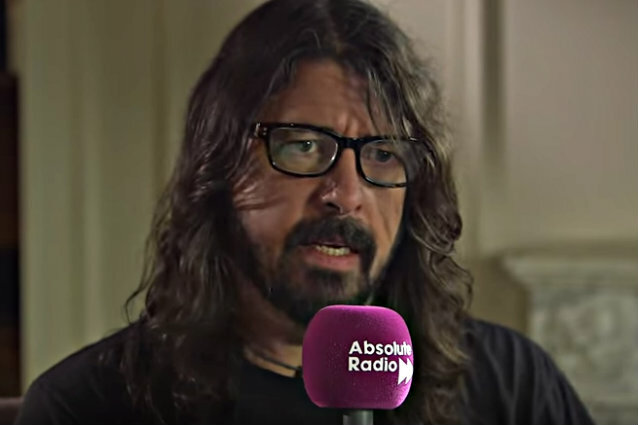 FOO FIGHTERS frontman Dave Grohl spoke to U.K.'s Absolute Radio about Justin Timberlake's guest appearance on the band's new album, "Concrete And Gold". "He's the greatest," Dave said (see video below). "He's fun, he's smart, he's funny, obviously he's really talented. He's fun to hang out with. I mean, his career has taken him to quite a ride — going from the band that he was in when he was young and then going solo and then all the acting and stuff. He's really legitimized himself as an artist and a songwriter. And when he came in to sing on this song with us, he was such a pro, man — it was just like that [snaps fingers]; his pitch, his singing, everything was perfect. And then he gets behind the desk and he says, 'Okay, you might wanna roll off a little 2K on the high-frequency thing with the three-part harmony, favor this line over the others because that's the root note. He seemed like a producer, you know." Prior to announcing Timberlake as the mystery guest on "Concrete And Gold", Grohl previously described the singer and sometime actor as the "world's biggest pop star" and "more than a pop star," adding that he'd "been around a long time." In an interview with Rolling Stone, Grohl said that FOO FIGHTERS' collaboration with Timberlake came about because they were recording at the same Los Angeles studio and would hang out. Grohl explained, "We'd drink whiskey in the parking lot. He was really, really cool. Then the night before his last day, he says, 'Can I sing on your record? I don't want to push it, but — I just want to be able to tell my friends.'" Timberlake ended up doing background "la la la" vocals on the song "Make It Right". Other cameos on "Concrete And Gold" include Paul McCartney, THE BIRD AND THE BEE's Inara George, THE KILLS' Alison Mosshart and BOYZ II MEN singer Shawn Stockman. FOO FIGHTERS have lined up a fall North American tour that kicks off on October 7 in San Bernardino, California with Cal Jam 17, also featuring QUEENS OF THE STONE AGE, CAGE THE ELEPHANT, Liam Gallagher, ROYAL BLOOD, THE STRUTS and more. The rest of the tour begins on October 12 in Washington D.C.